A friend of mine told me her son, when asked what he wanted for his birthday, has repeatedly requested a jetpack. Unfortunately she was unable to find one, even in toy stores. But it's her lucky day. Apparently, you can now buy your own jetpack, for the low price of a hundred thousand clams. 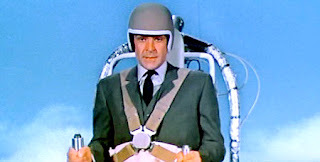 Why should your kid have to watch Thunderball and envy James Bond all those cool gadgets? So parents all over may now opt to screw the college fund and give their kids a little fun for a change. After all, in Barack Obama's USA, it's pretty tough for grads to find a job no matter what they do. But if you really want to be a stick in the much, you can save the hundred K, and go 15 minutes for a mere 215 bucks. That's actually quite a bit more than James Bond used it, and he just stashed it in a car trunk afterward. I wonder whether a James Bond car would cost as much as the jetpack. Any teachers out there driving James Bond cars? Do you need them around your school? Or is the system not quite so bad as Davis Guggenheim says?